Eddie Murphy demonstrates his incomparable comedic talent in the beloved 80s classics TRADING PLACES and COMING TO AMERICA, available individually on Blu-ray™ + Digital June 12, 2018 from Paramount Home Media Distribution. Celebrating its 35th anniversary, TRADING PLACES pairs Murphy with Dan Aykroyd in director John Landis’ sidesplitting social satire. A small-time con artist switches roles with a big-time stock market maven as part of an idle bet between two mega-rich brothers. But when the truth comes out, the consequences are pure comedy gold. The Blu-ray includes multiple behind-the-scenes featurettes, as well as access to a digital copy. 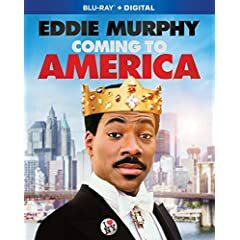 In COMING TO AMERICA, which celebrates its 30th anniversary in 2018, Murphy reteamed with director John Landis to play a pampered African prince who disguises his identity to roam the U.S. in search of a bride. The film also stars Arsenio Hall and James Earl Jones and features a variety of cameos, including Don Ameche and Ralph Bellamy from Trading Places. The Blu-ray includes vintage interviews with the cast, behind-the-scenes featurettes, a photo gallery, and access to a digital copy.